Empire’s craftsmen and women build each mantel from 3/4-inch fine-furniture grade cabinetry components, including MDF wrapped in select hardwood veneers. Because this natural wood can vary in appearance, we grain-matched the components for each mantel, to ensure you get a great looking mantel. 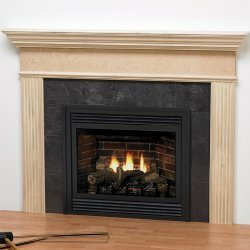 Each mantel is detailed in matching solid wood trim – in oak or poplar. The full 3/4–inch cove moldings and edge trim add structural integrity. Matching decorative trim pieces – in complementary sizes – add beauty and character. Special tooling and a controlled environment allow our craftsmen to assemble your mantel with greater precision and tighter joints than all but the most skilled custom woodworkers can achieve. Review: The quality is good, but not like a carpenter handmade it. The price is great though and serves the same purpose so we are happy.